Holy Cow another birthday! Yes friends, there is a birthday in the house and its not mine but a super wonderful friend who hails from Texas! Happy birthday you and many more! I love this Tammy :).. YOur cards always put a smile on my face. LOVE this and so will the birthday girl! That cow is so cute! This one sure made me smile! Great image and card, Tammy! Love it! 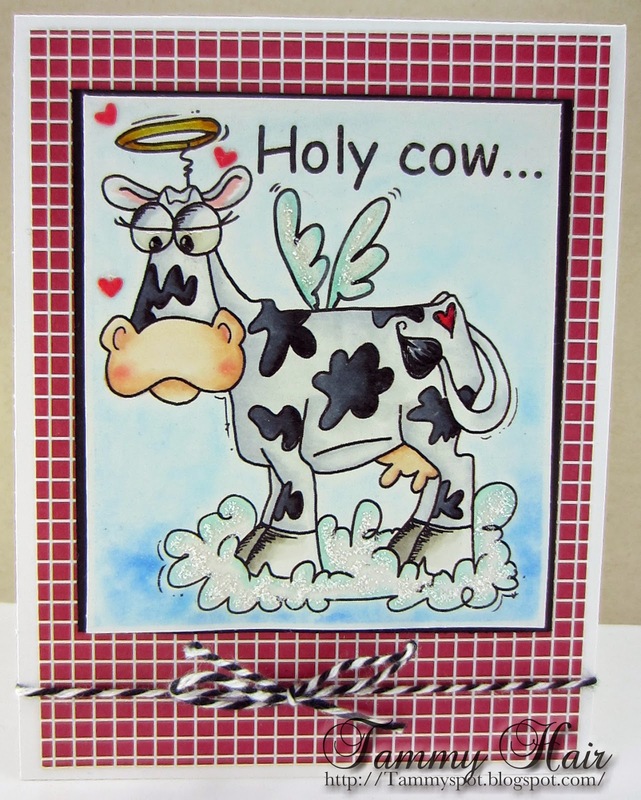 What a cute "Holy" cow!! Adorable card! O h my,what a great fun card Tammy!!! Well, Holy Cow I LOVE it!!! Your birthday friend from Texas truly loves it ---- YES she does! Thank you!!! You just made my day! How adorable! Love the black white and rd color combo - super cute and festive!! This is adorable! Love the glittery accents too. What a punny cow! Love it! Holy cow, we are getting old! I hope Lynn had a fabulous birthday!! Lovin it lovin it lovin it! Great image, love the papers & the glitter is the perfect touch!